North Eastern Railway Recruitment 2018 Notification is released by the officials of the North Eastern Railway. There is a total of 836 Ex-Servicemen Vacancies. Now, all the interested candidates, can go ahead and apply for this NER Recruitment 2018 before the final date. As per the details in the notification, 26th December 2018 is the final date. After the final date, no application will be considered. So, go on and check all the details. And then go on to submit the application form. Remember as of the time of applying, each and every candidate need to have all the Qualifications correctly. Check out the complete details about the North Eastern Railway Recruitment 2018. And then proceed to apply for the available 836 Ex-Servicemen Positions. All you have to do is apply by submitting the application form before the final date. Remember, after the final date, your application, will not be accepted the officials. So, hurry up and apply for the North Eastern Railway Recruitment 2018, after checking all the details clearly. Always remember to apply, only when you are eligible, and have had all the Qualifications correctly. If not such applications will be rejected with those submitted after the final date. Maximum Age can be 65 years. Like all the details we shared about the North Eastern Railway Recruitment 2018? Well, then check our site Freshersnow.com for more such information. North Eastern Railway Recruitment 2018 Notification is released recently. And through this Advertisement, the officials of the North Eastern Railway clearly mentioned details about hiring eligible people for available 745 ACT Apprentice Vacancies. So, if you are also in search for the Government Jobs in India. And want to get the Government job, then this opportunity is for you. All you have to do is check the total details about this chance. And then go on to submit the application form before the final date. As per the details in the advertisement, the deadline to submit the application form is 29th December 2018. Remember that after the last date, your application will not be considered. 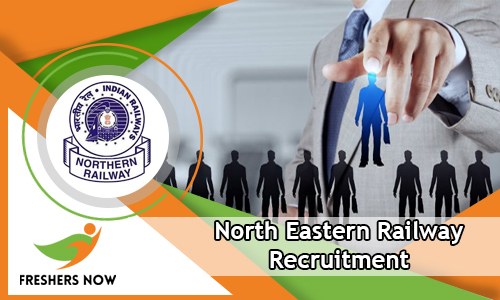 Check out the Latest release of North Eastern Railway Recruitment 2018 Notification. If you are interested in this, then apply for the 745 ACT Apprentice Vacancies. The officials of the North Eastern Railway mentioned some requirements in the notification. And all the candidates, who are applying should possess them. Then only the officials will accept the applications. If you are not eligible, for this North Eastern Railway ACT Apprentice Openings 2018, do not worry, because, on our site Freshers Now, you can find more other Government job notifications. All the contenders who are interested in applying for the North Eastern Railway Recruitment 2018, should have completed their ITI or Diploma in the Recognized Trade from any recognized institute or University. Aspirants age must be between 15 years to 24 years. For Age relaxation information check the notification. Basing the Merit in the Sports and Education. General and OBC: Rs.100/-. And remaining all others are exempted from paying. Check all the details clearly. And then submit the application form before the final date if you are eligible. Hope all the information we provided is useful for contenders who are searching for North Eastern Railway Recruitment 2018. Contenders who are searching for North Eastern Railway Recruitment 2018-2019 can refer this article thoroughly. Moreover, we are happily intimating that all the job seekers can apply for 58 Instructor, Group C, Group D Vacancies. The Board of Northern Eastern Railway has released many vacancies for the sake of the job applicants. Moreover, this is the time to apply for North Eastern Railway Recruitment 2018-2019. Therefore, we suggest all the candidates take a deep look at the current article very attentively. All the applicants need to grab the necessary information such as Educational Qualification, Age details, Application fee, Age Relaxation, Starting and Closing dates to apply, Selection Procedure, Salary info, etc from this article. Therefore interested candidates can apply through Online Mode. Moreover, we have attached the official Notification link at the end of this article so stick to this article. Right now many of the aspirants are in a dilemma about where to check the proper details about North Eastern Railway Recruitment 2018-2019. For those people, we recommend to refer the whole article and utilize the valuable information. We are informing that a massive number of competitors are in a race to apply for North Eastern Railway Recruitment 2018-2019. Moreover, as soon as possible all the interested aspirants should apply before the closing date 30 April 2018. Therefore many of the candidates are asking to provide the eligibility criteria for the North Eastern Railway Jobs 2018-2019. So, for the sake of the aspirants, we collected the primary information and equipped in this post. All the aspirants without late grab the info which we have furnished in this article and proceed for the further process. Moreover, by checking the above table, all the aspirants can know the minimum details regarding North Eastern Railway Recruitment 2018-2019. Therefore get the details from the table such as the Name of the Organization, Name of the Post, Official website, Starting and Closing date of the Application, and vacancies released by the authority of North Eastern Railway. The board of Northern Eastern Railway has released 58 vacancies that are for Instructor, Group C, Group D Vacancies. We all know that every year a vast number of candidates are applying for the Railway jobs. Moreover, Age Relaxation will be applicable for some of the Categories. Moreover, coming to the Educational Qualification, all the aspirants must complete their Graduation or Any Bachelor’s degree in relevant specialization. Therefore before starting to apply for North Eastern Railway Recruitment 2018-2019, all the aspirants check the eligibility criteria. Moreover, North Eastern Railway Job Openings 2018 are the golden opportunity for all the job seekers who are waiting to crack the chance in the Railway sector. Nowadays many of the competitors are showing interest to apply for the Railway Jobs. The fee is different for Category by Category. All you need is to apply soon before the closing date so that there will be no hurry for the registration process. Therefore the Age limit for the aspirants is Maximum age is 52. And moreover, aspirants should have the two years service experience in the same post. Furthermore, contenders stay tuned to this article. For more queries refer the Official notification thoroughly. Moreover, all the aspirants should focus on the Selection Process. The Board will conduct two rounds to the applicants. One is the Written test, and the Other is the Viva Voice. Moreover, the competition of the Written test is very high. Contenders are suggested to prepare well to secure the minimum marks in the test. Furthermore, only those candidates who will obtain the Qualifying Marks in the written test are only allowed to attend for Document Verification. To help the aspirants, we also furnish the Syllabus and the Model papers in the upcoming article. Also, the authority pays an impressive scale to those candidates who got selected in all the rounds conducted by the authority.Therefore follow the current article and apply for the North Eastern Railway Recruitment 2018-2019. Hence scroll down and check the remaining data. Moreover, we suggest all the aspirants verify the eligibility criteria and apply for the North Eastern Railway Recruitment 2018-2019. Therefore the board is strictly specified that aspirants should complete any Bachelors’ degree or should complete any equivalent courses. The maximum age of the aspirant should be 52 years. The Age relaxation is applicable for some of the categories. Moreover coming to the selection procedure aspirants must face the following rounds. Candidates need to check the Application fee in the Official Notification. Moreover, at the end of this article, we have attached the direct notification. So, click on the link and check the Application fee details. Furthermore, by following the above procedure candidates can apply for North Eastern Railway Recruitment 2018-2019. Contenders are suggested to apply before the submission date. We hope all the job seekers got the necessary information regarding North Eastern Railway Recruitment 2018-2019. Moreover, if you have any doubt then leave a message in the comment section. For latest updates keep browsing Freshersnow.com regularly.